Jefferson University East Falls Campus faculty members use multiple, effective methodologies that embody the four pillars of Nexus Learning (See About Us for more). Within this past year, Jefferson University East Falls Campus has implemented four Nexus Learning Hubs (Hayward 111 and 211, Downs Hall 2, Tuttleman Center 209) - novel learning spaces that are thoughtfully designed to act as the catalyst for pedagogical training, nurturing, and experimentation. These spaces represent innovative rethinking of the classroom space that allows the learning facilitator to be less encumbered by the physical constraints of space, furniture and technology. These spaces ultimately enhance student learning and creative teaching. For example, the Nexus Learning Hubs allow for seamless transitions to different modes of active and engaged learning. The hubs also optimize collaborative involvement for all students through movable furniture and appropriate technologies that fosters co-creation and sharing of ideas. 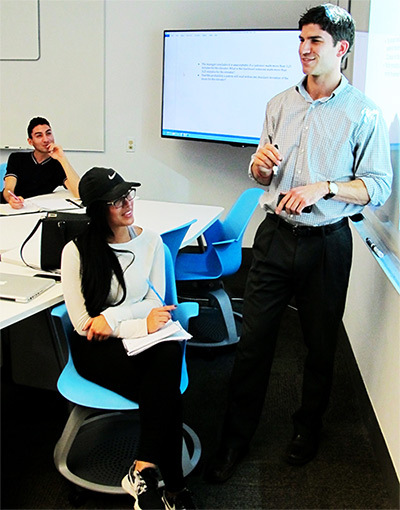 Through surveying over 500 students in the 2014-15 academic year, our students self-reported significant gains in class participation, ability to focus, instructor feedback opportunities, learning through multiple means, physical movement, stimulation, and comfort level in Nexus Learning Hubs compared to traditional classrooms on campus. In addition, through observations and faculty discussions, these learning spaces were perceived and valued as environments where space and technology enhanced the learning experience for our students.